The Original Milo & Gabby Animal Baby Pillowcase for babies, toddlers and kids - 100% Cotton. The original Milo&Gabby’s animal-shaped pillowcases are sure to capture your little one’s heart and imagination! Made with ultra-soft 320-thread count sateen cotton, your baby will have sweet dreams with this pillow friend by their side. Sized just right for your growing baby, our pillowcase measures 10" x 13" and is compatible with our 3D Mesh or Charcoal Foam Bead Pillow insert (sold separately). Easy to clean- simply unzip, remove the pillow, and toss the pillowcase in the washing machine. 100% Cotton. Imported. Recommended for ages 3 months and up. Don’t forget to choose the 3D Mesh Insert or the Charcoal Foam Bead Insert! The pillows are sold separately, but they pair perfectly with the pillowcases! HIGH QUALITY MATERIALS - Made with ultra luxurious 320 thread count sateen cotton that is silky soft and cool to the touch and includes an easy fold over sham design. Pillow insert sold separately. MACHINE WASHABLE - The Milo&Gabby® pillowcase is machine washable and easy to clean. Machine wash delicate cycle, cold water. Line dry recommended. Do not bleach. Do not dry clean. 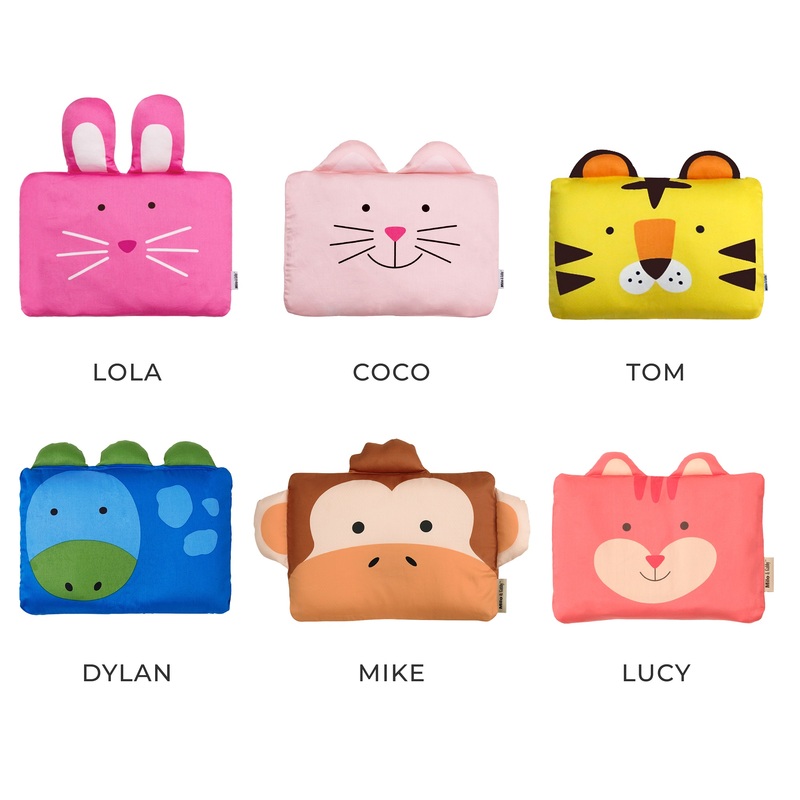 ADORABLE ANIMAL DESIGNS - Choose from our full line of charming Milo&Gabby animal characters: Lola the Bunny, Coco the Kitty, Tom the Tiger, Dylan the Dinosaur, Mike the Monkey, and Lucy the Squirrel. SIZED JUST RIGHT FOR BABY - Our mini pillowcases, paired with our matching inserts, make a great "first pillow" for babies. Each pillowcase is compatible with pillows measuring 10" x 13". Pillow sold separately. Ultra soft, 320 Thread Count sateen collection sheeting. Compatible with any 10” x 13” pillow. Pillowcase and insert sold separately. Insert (sold separately) Custom Size: 10 x 13"
I got the tiger pillow case for my 16 month old and he absolutely loved that it was small and cute just right for his head. He loves carrying the tiger by the ears and I love how bright the color is and easy to find if the little one looses it around the house. My sweet 1 year old loves his Milo and Gabby toddler pillowcase! The tiger is so soft and adorable. He loves the little ears and carries this around with him everywhere! Sometimes he even pretends to share his lunch with it! Easy to wash and came out perfect! Now change pillow.. She head stay pillow..